If you are looking for a Xerox Color copier for your business and want a machine that is cost effective as well as robust and easy to use, you should consider the Xerox WorkCentre 6655i copier. This is the model that replaced the Xerox WorkCentre 6655 copier. The “i” nomenclature refers to the intelligent design that allows for apps to be added to the copier to improve work process and make life easier for your company. You should expect to pay around $60 per month on a lease for this copier and maybe 10 cents a color page. It is a bargain for those medium sized printing groups that do not need 11X17 paper capacity. 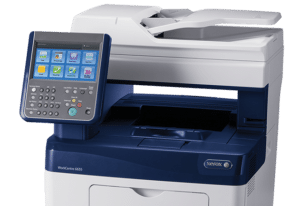 The Xerox WorkCentre 6655i is one of our best selling models, and we feel comfortable up to 15,000 printed pages a month with this copier. Are you looking for a color copier that is intuitive, easy to use, and low cost? The Xerox 6655i is perfect in those situations.